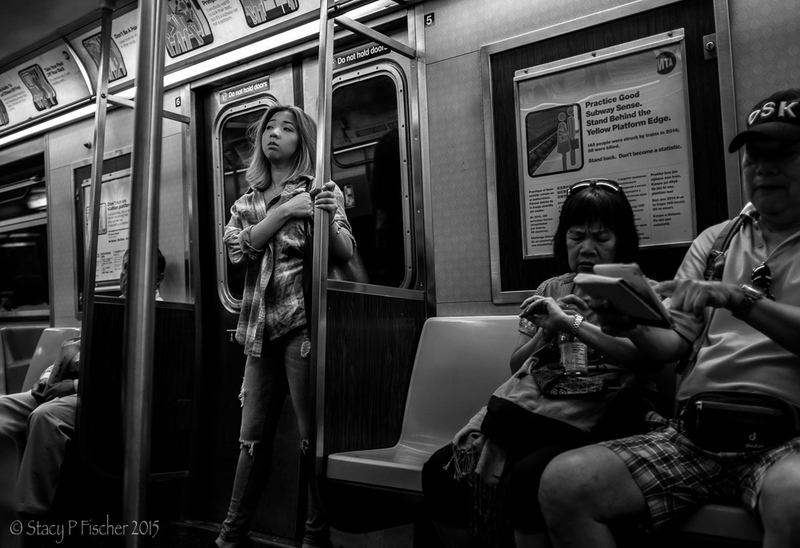 One of the many things I love about street photography in New York is the subway. You just never know who is getting on or what will happen. London Embankment Station at quitting time on a late December day, when the subway is full and the people are on the way home or heading for a pub. London is my forever love and from time to time I have to walk through, night and day. Photo taken in a London Subway train. On the bottom right, there are the “Hands” from my last post. No turning back ….. the people you meet while taking in the fresh air of a late night walk across Manhattan Bridge and a train comes to a stop beside you. I was struck by the wistfulness of this young woman and would have been happy simply capturing her. But then I saw the larger scene – the busyness of the couple to her right, clearly on a schedule – and loved the contrast. I just had to push the shutter. For more photos from New York City and elsewhere, visit VisualVenturing.com. (Equally as stunning in color on Visual Venturing.) 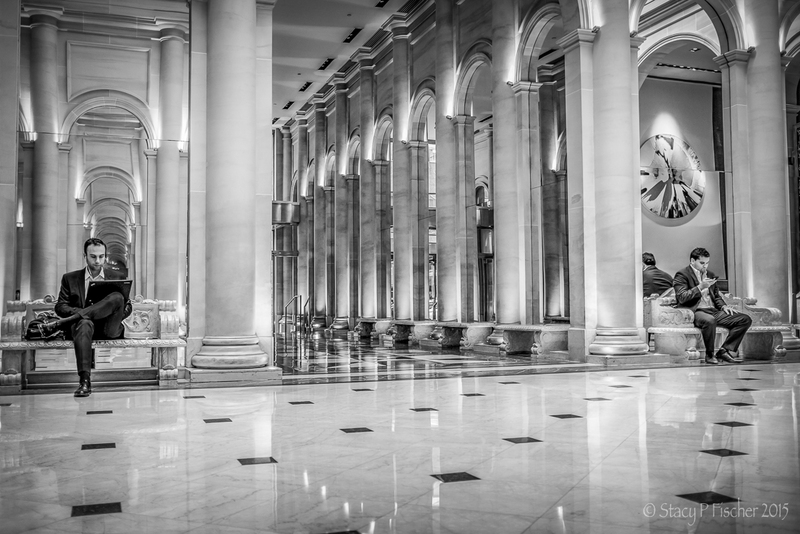 The perks of accompanying my husband on a recent business trip to New York City: staying in a Manhattan hotel with this amazing lobby. Sitting on the opposite side waiting for our names to be called for lunch in the hotel restaurant, I just had to take a picture — as much for the stunning mirrored architecture as for the two suited gentlemen busy on their respective electronic devices.